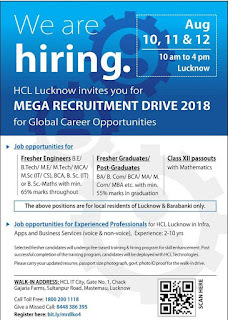 MEGA Recruitment Drive 2018 Apply Online For Latest HCL Jobs Fair 2018, Mega Recruitment Drive in Lucknow, Lucknow IT City Latest Jobs 2018. UP Private Company Jobs in Lucknow. Inter Date and Centers to attend Campus drive in HCL Lucknow. MEGA Jobs Drive 2018 HCL is Hiring Mega Recruitment Drive in Lucknow on 10 August 2018, 11 August 2018, 12 August 2018.You will have to visit on 10 AM Morning to 4 PM Evening to Lucknow. This is one way opportunities for all general candidates, Technical, Professional and Intermediate exam passed students. HCL Off Campus Drive 2018 Selected Students in HCL off Campus Drive in Lucknow will starts its training to focus on new type of Posts hired by HCL Organization or other company. HCL will also train you like a Kaushal Vikas Yojana for skill enhancement. HCL Jobs Training 2018:- Those who completed full training programme, learning on the jobs, candidates will be deployed under systematic method of local batting in HCL Technologies. Document required: - Candidates will bring segment to carry your resume, passport size photograph, govt, photo id proof for walk in drive. Fresh Engineers: - Job opportunities are for experience professional who wants jobs opportunities in HCL Lucknow in INFRA, Application and Business Service (Voice & Non Voice). Walk in address:- HCL IT City, Gate Number 1, Chack Gajaria Farms, Sultanpur Road, Maste Mau, Lucknow. Location: - The Above Position is for Local residents of Lucknow & Barabanki Only. Freshers Graduates/Post Graduates: - BA/BCOM/BCA/MA/MCOM/MBA etc with minimum 55% marks in graduation.